Traditional Chinese medicine Yunnan Baiyao has not been recalled on the mainland despite Hong Kong health authorities claiming to have discovered "undeclared" poisonous ingredients in some batches of the product and ordering it to be taken off shop shelves. The Department of Health of Hong Kong announced on Tuesday that it had tested samples of capsules, powder, plaster, aerosol and tincture of Yunnan Baiyao distributed by wholesaler Fung Wah (Hong Kong) Co, and found they contained "undeclared aconitum alkaloids". "According to the products' registration details and the Chinese medicine literature, the ingredients in the products cannot account for the presence of aconitum alkaloids as detected," said the department in its statement. According to the statement, if used improperly, aconitum alkaloids can "cause discomfort, such as numbness in the mouth and limbs, nausea, vomiting and peripheral weakness, and even lead to life threatening conditions such as breathing difficulties and cardiac arrhythmia". Produced by Yunnan Baiyao Group, a medicine maker in Yunnan province, the product is a well-known traditional Chinese medicine that is effective in stopping bleeding and treating pain in muscles and joints caused by bruises and rheumatism. The department said although it has not yet received any reports of users suffering adverse effects from the product, it ordered the recall. Yunnan Baiyao Group confirmed in an online statement on Wednesday that such products contain aconitum alkaloids, but the toxicity is "greatly reduced" after "unique methods of preparation". The medicine is still available in pharmacies in Beijing. Three stores in the capital's Chaoyang district said they are still selling the medicine over the counter. "It has always been a solid seller and sales have not been affected," a saleswoman at Hedantang Pharmacy said, adding that she had not heard the news of recall in Hong Kong. The discovery of the poison has ignited heated public discussion because the ingredients of Yunnan Baiyao are not readily available. 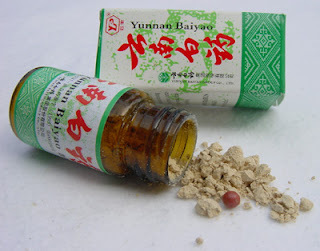 A Yunnan Baiyao tincture purchased in Beijing, one of the products whose samples have been found to contain aconitum alkaloids in Hong Kong, has written on its instructions that its ingredients are "nationally classified", but advises against use by pregnant women and people allergic to alcohol. The government classified the medicine's formulation and the way it is processed in 1956, and more than 100 million people have used the medicine in the past decade, the company said in a statement. The State Food and Drug Administration has graded the medicine as "level one" TCM to be protected by the government, and its formulation and preparation are classified until August 2015. But the administration said it has asked the company to revise the medicine's instructions and keep a close watch on reports of adverse reactions. The administration has also warned the public to only use the medicine under a doctor's instruction. A Notification Letter for a Statement on a Dietary Supplement, that a California-based distributor filed to the US Food and Drug Administration in June 2002, named the ingredients of a product called Yunnan Baiyao Ding, which claimed to be manufactured by the Yunnan Baiyao Group. The statement did not include aconitum-related ingredients. On Jan 17, Luo Qiulin, a lawyer, filed a lawsuit in Hunan province against Yunnan Baiyao, claiming that the company infringed on consumers' dignity and their right to know. However, Huang Jianyin, undersecretary-general of the World Federation of Chinese Medicine Societies, said it makes sense for Yunnan Baiyao Group to classify its ingredients in order to protect its intellectual property rights. "The national regulations justify it, and if other medicine makers got its formula, they may make generic medicines and harm the company," he said. "If consumers don't trust Yunnan Baiyao, they can switch to replacements." With regard to its ingredient statement to the US, Huang said domestic medicine makers need to adjust to laws in other countries in order to get into markets overseas. In an online survey conducted by Sina, more than 8,600 Internet users said they would use the product despite the incident, accounting for 51 percent of the people polled. Nearly 30 percent said they would not use the products of Yunnan Baiyao. This was so scary. To think that people are still buying Yunnan Baiyao even with the fact that it was so harmful to people. Their government must act immediately regarding this matter.